The Power Rangers franchise is a peculiar phenomenon that boasts several generations of nostalgia sewn onto its belt. It was originally spliced from a Japanese TV series known as Super Sentai, with young American adults unconvincingly acting out their roles as school kids from Angel Grove. The production value was laughably cheap in every way possible, yet it never stopped expanding the imagination of children who were – and still are to this day – inspired by the ballroom dance of Eastern martial arts. I was one of those pre-pubescent kids who would never miss an episode every Saturday morning during the early-to-mid ’90s, knowing full well that each and every one would ride the same formulaic beat like clockwork. The dedication did seem worth it though, especially when the Green Ranger made his first appearance as the bad guy donning a dagger flute and a Mecha Godzilla knock off. My young, easily satisfied mind was completely blown. With that said, when I first heard about this upcoming Power Rangers fighting game I was both skeptical and utterly intrigued, to say the least. But, when I found out that fighting game veteran and multi-title EVO champion Justin Wong was involved to help balance the gameplay mechanics, I suddenly felt the certain need to definitely give this one a shot. The problem is, Power Rangers: Battle For The Grid is an incredibly disappointing game. Yet, maybe not quite in the same way as I had first ignorantly assumed. 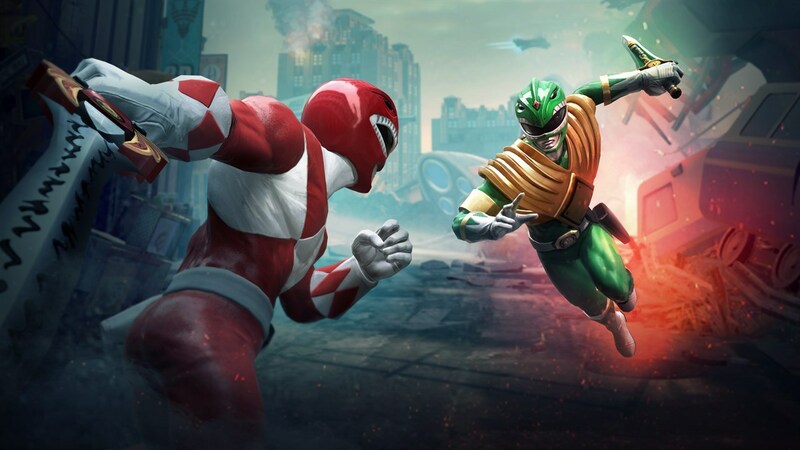 I dug into this one expecting an awful fighting game developed by the micro-morphing transaction makers of the mobile game, Power Rangers: Legacy Wars. That free-to-play fighting game (if you can call it that) somehow managed to borrow the Street Fighter license from Capcom for an odd but undeniably cool crossover. In any case, what took me off guard was despite there not being a decent Power Rangers game in existence, nWay has somehow managed to make a competitive fighting game with the brand that has strong baseline gameplay mechanics. Think of it as a fighting game influenced by Dragon Ball FighterZ mixed with the animation traits of Killer Instinct. This three-on-three brawler has some meat on the bone when it comes down to its combat system. As well as nailing auto-combo attacks with light, medium, heavy and special, each team has assist attacks that allow for handy counters and flashy combo strings. Teammates can be tagged into the fight to grant their battle-worn allies some rest and can also be forced back in under the pressure of a swap attack. There’s even some decent guard mechanics in place that can create some space between players in a similar fashion to other anime games, such as the BlazBlue series. The animations of character attacks too have a really nice flow and impact to them, making the first impression a surprisingly promising one. However, where the cracks begin to show is wholly down to the barebones presentation and small one-sided roster. In fact, the game should be called Power Rangers: Loser Pays The Bill due to 90 percent of the cast being the good guys who are left to beat the crap out of each other. The only baddies that are involved in the base game are Goldar and some black Shovel Knight-looking fella who I assume arrived into the series long after I stopped watching it. Considering how many different characters have surely been introduced over the years, it really doesn’t make sense as to why the game has such a limited starting lineup. There is the Season One Pass that you can purchase, which, at this point in time, gives you little more than a handful of character skins – you know, the stuff that should really be unlockable as a reward for simply playing the game. What makes matters worse is how bland the five environments are in this game – one of which is the empty training stage. They lack both character and life in how clearly thrown together they have been. You do get to fight in the Power Rangers’ famous Control Centre which is always a plus, but with Zordon’s head loitering in the background looking like he’s been spiked with laxatives it soon becomes both unintentional comedy and disturbing horror at the same time. As a whole package, Power Rangers: Battle For The Grid lacks any attention to the finer details and the music is mostly incredibly bland. This is all so very unfortunate considering that there genuinely is a potentially good fighter hidden behind a thin sheet of rice paper. To top it off, the character designs are fairly decent considering the game has clearly been developed within the constraints of a tight budget with change to spare. Each character plays very differently from one another and the game does hold depth with its simple command input system and combo potential. Having the ability to call upon a Megazord (or a giant Goldar) during combos is a fine touch without disrupting the flow of gameplay. There’s clear evidence that there has been some effort and research made into developing a decent fighting game that’s true to the brand. For example, the iconic tune that the Green Ranger plays through his dagger flute to summon the Dragonzord – a little bit more of that and we could have possibly been on to a winner. Fair enough, the game comes in at a budget price range. I just couldn’t help but wonder how Power Rangers: Battle For The Grid would have turned out with a larger flow of funding to deliver on the game’s clear potential. I could picture the corny story mode in place, more fulfilling stage environments, interesting additional modes, and a much wealthier line up of fighters. Instead, we’re left with a bog standard arcade mode that suffers from little variety in opponents that I easily managed to beat in less than 10 minutes. At least there’s still couch competition and a cross-platform online mode to pursue my new career in becoming a Power Rangers champion. Which leads to the next biggest surprise. Power Rangers: Battle For The Grid does happen to have a pretty decent netcode when duking it out online. That is if you’re lucky enough to actually find a match. Having the extra bonus of cross-platform play should really be a sure-fire hit to get a few extra bites from the competitive pond. Instead, I just kind of hung out there most of the time re-reading the same bit of trivia about the series over and over again until the lobby timed out. There’s no possible background matchmaking to set up in an effort not to waste time either, and worst of all, there’s no online lobbies to throw out your Morphin’ Time skills with anyone on your friend list. To put it bluntly, Power Rangers: Battle For The Grid is pretty much a proof of concept that should have been pitched for a crowdfunding campaign. If anything, the fact that it’s halfway decent makes me feel uncontrollably angry inside. There’s a part of me that wishes this was simply a terrible game through and through. Now, I can’t help but pine for a good, big budget Power Rangers fighting game with bright camp colors and horrifically acted cutscenes. Damn you nWay, for reigniting my childhood with such genuine potential. I’m left feeling like I have been gifted a cool Power Rangers toy from a charity shop that’s missing most of its pieces.